These are some pictures of our products, produced in our loft in Sweden. 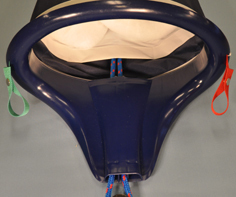 You can read about Lazy bag, Furling genua cover and our snuffer. Please contact us either on email or by phone if you are interrested in some of our products. This is our solution for Lazy bags. Bigger covers can have the zipper on one side to make it easier to reach. The covers are delivered with all the lines you need lazy jacks included. Outside Sweden we don´t supply the battens. It´s too expensive to send them. We give the length of the battens on a tag visable outside the package. 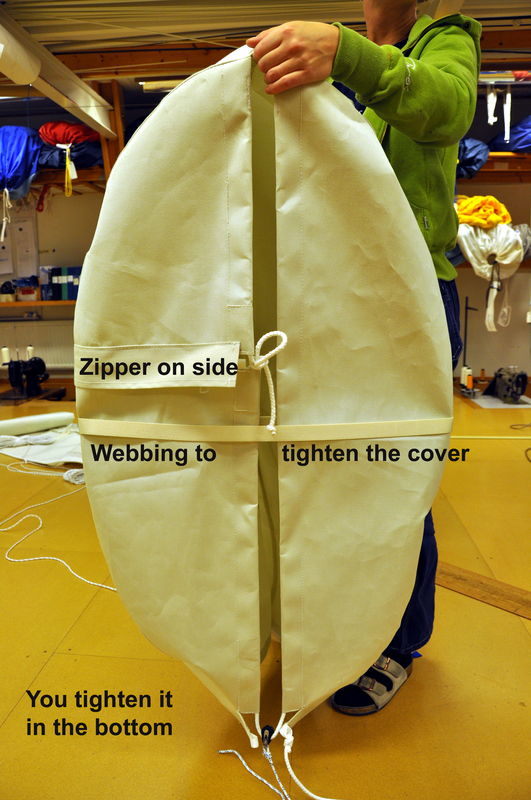 We use round 10 mm fiberglassbattens which most sailmakers have in stock. Note that there is no extra "hood" upfront our solution. We use New Sunbrella which is a real cover fabric without coating. The reason is having a better water proofness, yet breathable. Here is the difference from other solutions. A block sheave instead of an eyelet or plastic shackle reduces friction to almost zero. 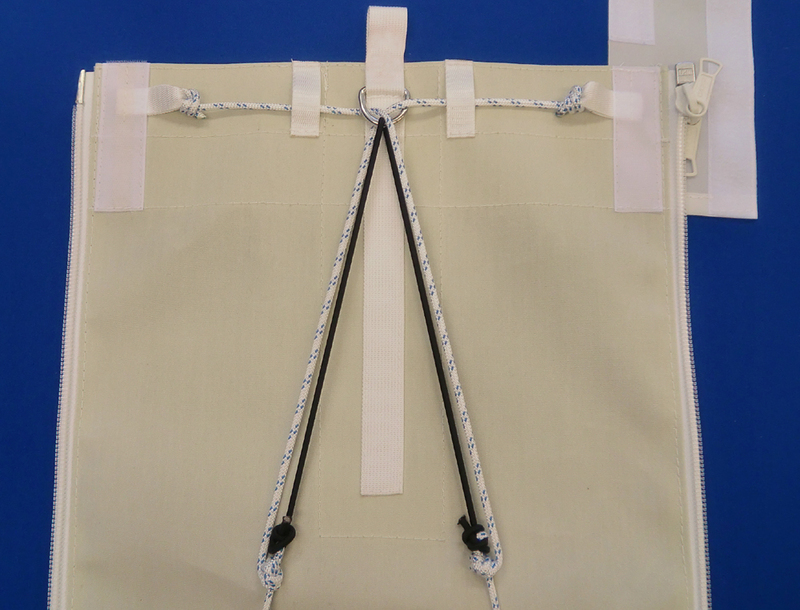 This makes it extremely easy to pull the lines and tighten the cover around the sail. 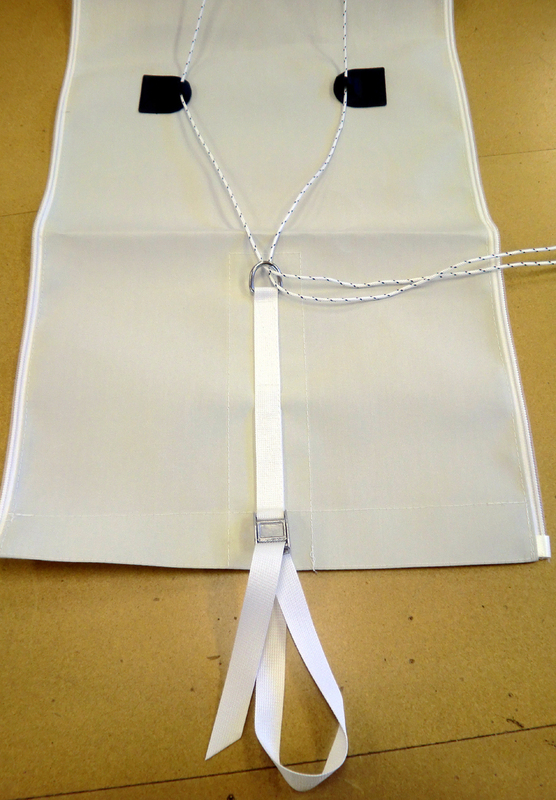 If you can´t tighten the lines around the cover properly it will flutter in increasing wind and will be damaged. Little friction makes it easier to loosen the tension as well, when it´s time to take the cover away . This plastic item has a design protection all over Europe. A handling bag is supplied with the delivery. Hoist the cover out of the bag and pull it down directly into the bag . It can´t be easier. Our snuffer was awarded best sock in market 2011 in the segelmagazin "Segeln"
It has separate rooms for the manoevre lines . The funnel is unbrekable and weighs only 375 grams. The cloth is nitted not woven. This makes it almost untearable. The cloth is siliconized so it want be wet and makes the friction much lower between the sail and sock.